Our clients, Stephen and Carol, found Boho online and made it a point to visit us on Stephen’s motorcycle trip in Arizona. During this meeting, they vetted the tan/gold van we had just scooped up and decided they wanted it for themselves. Residing in London, we knew the design would be a bit different as the electrical plugs and hookups were different than we what we were familiar with. Iris was built with the harsh European winter in mind, as we upgraded the inverters to support both a water and space heater. Since Stephen and Carol travel often with their two small dogs, we were able to provided a custom “bungee cord containment” solution (not pictured) to keep the pooches off the bed at night and away from the upfront cooler. We also provided a refrigerator beneath the bed and a removable table with swivel seats to ensure eating on the road was a cinch. 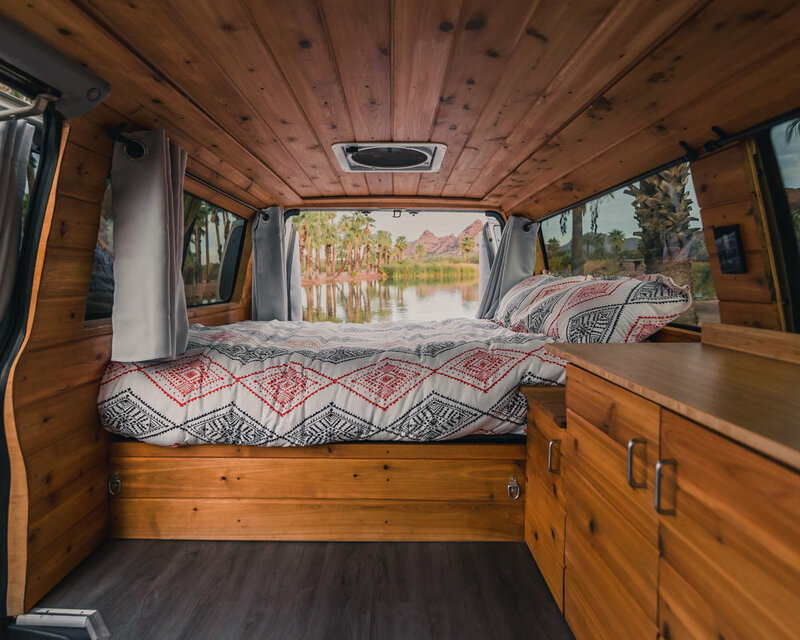 Finishing touches included a stained red cedar to keep the space feeling warm inside, as well as a bluetooth stereo deck/dvd player for extra entertainment.